Ross Levinsohn has resigned as president of FIM and will be succeeded by Peter Levinsohn, president of digital media for the Fox Entertainment Group since 2004 and an 18-year Fox vet. The change, announced by Peter Chernin, president and COO of News Corp., is effective is Nov. 27. So far, neither Levinsohn has been available for comment but I have talked to a number of sources. From what I hear, this was Ross Levinsohn’s decision, starting with discussions at least two months ago. It seems to make sense all around. Ross got the chance to build the division from scratch and would rather create something again than be the hands-on, long-term operator FIM needs now. Granted, multi-billion budgets for building are pretty darn rare (so are acquisitions like MySpace) so that feat may not be replicated any time soon. He has been intensely headhunted since FIM took off but the direction he’s taking next has yet to be finalized. I gather we shouldn’t expect to hear that news in the next week or so unless circumstances change dramatically. I wouldn’t be surprised to see him wind up with VC backing to piece together another internet company or working with another major company as a builder. Certainly, the announcement of his departure from FIM has opened the pipeline for offers from companies who didn’t think he was available so whatever he was thinking about when the day began could take a detour. 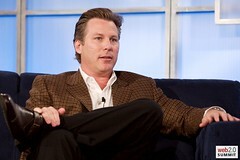 While Ross Levinsohn was buying traffic and pulling together a network, Pete Levinsohn was patiently developing and implementing the strategy for Fox to make money for the use of its content. He is credited as a key architect of the digital revenue sharing agreement between Fox and its affiliates. Pete and his team are also credited with leading Fox On Demand, the ad-supported online VOD service available on the Fox o-and-o MyFoxLocal sites and MySpace.com. The deals with iTunes, Amazon, the movie download services — all came through Pete’s group. Is he the best choice? Pete’s certainly the logical choice internally and, while he doesn’t have the net cred Ross brought with him to FIM from Fox Sports and before than Sportsline, his time in the digital rights arena should give him an understanding of the business models at work. — What happens to his group next? A company spokeswoman tells me that it will not be folded into FIM, as one source suggested might be the case, but no word yet on a successor. (From my vantage point, folding it in could create some tension since the group negotiates for a variety of Fox units — and sometimes for deals with FIM.) That’s just one of the questions left hanging at this point tonight. — One notion that is sure to be raised is the idea that this is somehow related to the recent departure of Mark Jung as COO. I am told the two are not related. Will his role be filled? Add it to the list of unanswered questions. I actually had it in there and then managed to leave it out. They're cousins, which I believe they discovered after they started working together at Fox. Is Peter Levinsohn related to Ross Levinsohn? Surprised that I've seen no comment on this anywhere… thanks. Interesting turn of events, as media companies start changing out their innovative digital heads for longer tenured operators. Is it a case of too much new opportunity and a heightened sense of ownership or entrepreneurial possibility – or – are the media congloms just not willing to share the equity with their new generation of execs? What is the upside to innovation in a marketplace built on traditional executive values? Kudos to Ross for looking to create and aggregate a portfolio of companies with traffic, if what GigaOM suggests is true. Innovation should be allowed to grow even after it's accepted…but better still if there's personal ownership involved.